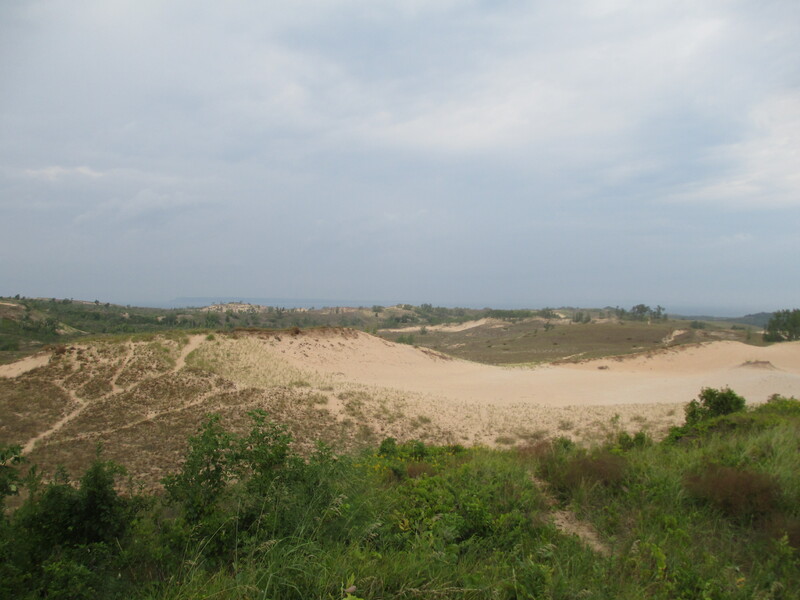 The winds off of Lake Michigan have, over many years, created massive sand dunes on the shore. These dunes are so big they seem rather unimpressive at first glance. When you first step out of your car, it’s no different than looking out over any other bluff onto the lovely but expected Michigan scenery. It’s only after you really consider the ground beneath you that it becomes impressive. 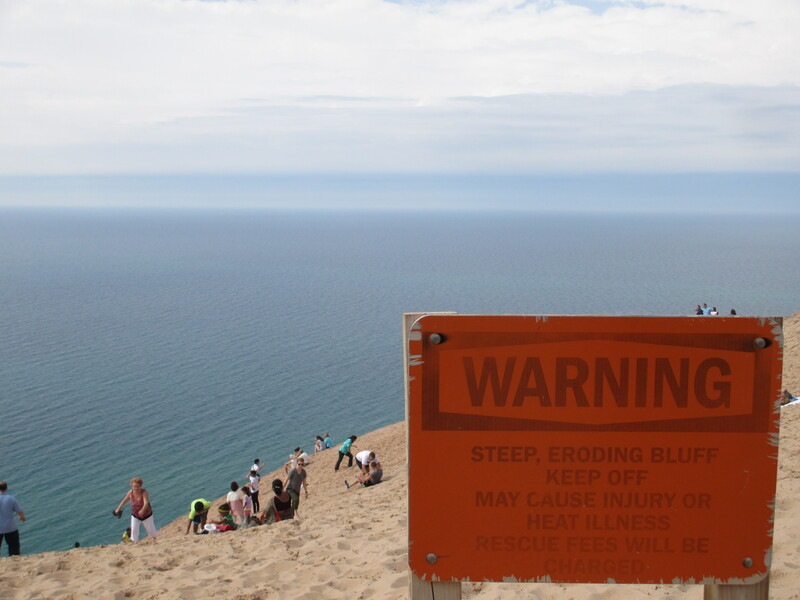 You are not standing on a cliff that is covered in sand. It’s sand all the way down. I took a detour to the unfortunately named Inspiration Point before hopping on the Pierce Stocking Scenic Drive. 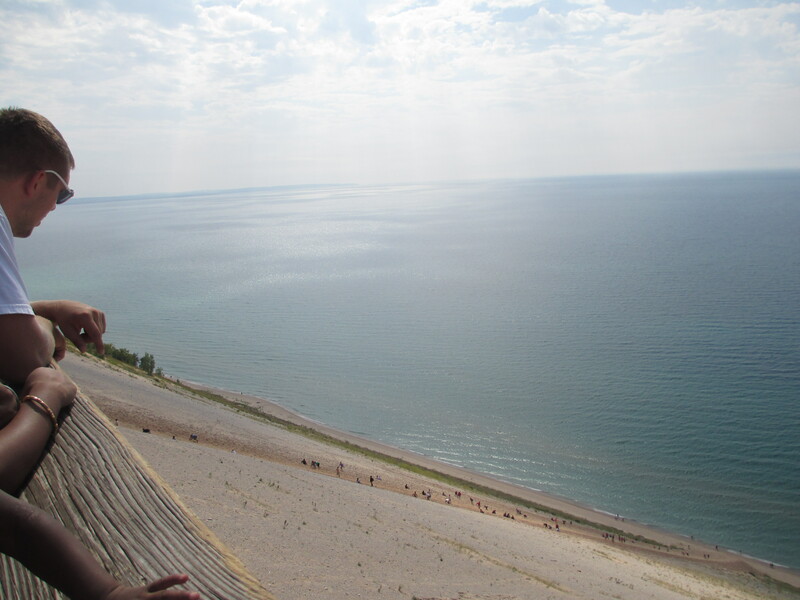 One of the final stops on the scenic drive is the Lake Michigan Bluff, which has an unobstructed sand slope from the top of the bluff all the way to the water. Despite the many stern and clearly posted warnings against it, many visitors felt the need to run all the way to the bottom. I opted not to do so, having paid a lot of attention to the people trying to climb back up. As a casual observer, I would estimate that the distance to the water is at least 200 meters, and the incline stays at a steady 45 degree angle the entire time. People weren’t hiking back up, they were crawling on all fours. Plenty were just sitting down, and I couldn’t tell if they’d wised up and stopped their trek to the bottom, or simply run out of steam on the climb back up. Perhaps I should have asked one of them if it was worth it, though I imagine for many such adventurers pride would have gotten in the way of the truth. Regardless, there was another dune to climb. This one was park-approved and traveler recommended. I drove over to the creatively named Dune Climb and parked my car at the base. It didn’t seem like much. It was steep, but not unreasonable. It was sandy and hard to walk through, but I gathered that was sort of the point. It was also immediately clear that the whole point of climbing up was the amazingly fun run back down. I dropped my shoes at the bottom (as was the custom), and started up the dune. It only took a few minutes to get to the top. Or rather, it only took a few minutes to get to the edge that I thought was the top, only to see another 20 minute climb ahead of me in order to get to the actual top. The second half of the dune leveled off for a bit, but there was a lot of distance between me and the small pair of benches at the peak. I carried on, watching the teenage boys race each other to the bottom and seeing the little kids chase after the tumbleweed. There was something a bit surreal and foreign about being surrounded by so much clean, soft sand, yet being no where near a beach. When I finally reached the top, I took a spot on the open bench. My feet dangled off the end. So much sand had eroded away since the bench was installed, I could barely get up onto the thing at all. I took a deep breath, admired the view, and then took off. There is only one way to get down off the Dune Climb, and that is running at full speed like a 3rd grader. I ran the first third of the way, then switched to a wide, hopping, side-to-side stride. Each step sunk deep into the sand and sent me further forward. My limbs were flailing in every direction and I would have felt self-conscious had it not been so ridiculously fun. It helped that I wasn’t even close to having the silliest stride on the dune. When the sand leveled off in the middle I slowed back to a walk in order to catch my breath. There was one more run to go. 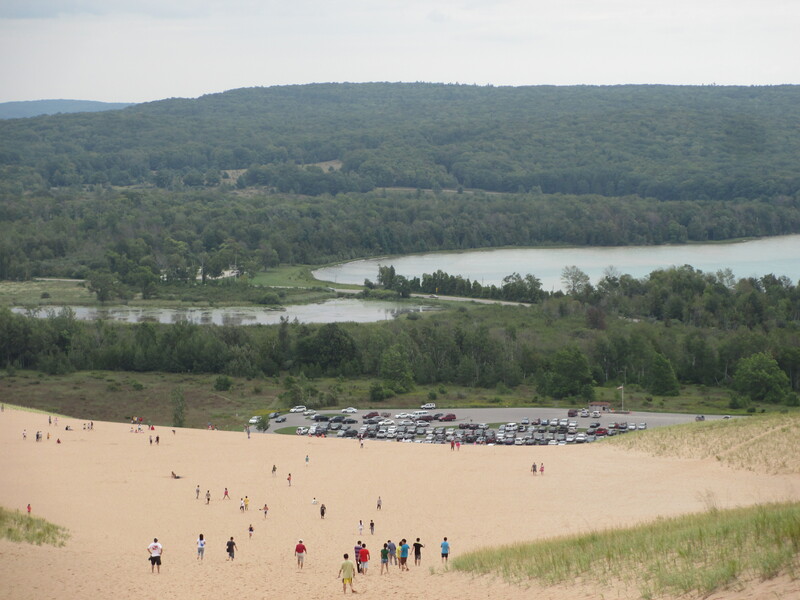 It was the short but steep stretch I first saw before I realized how big the Dune Climb really was. I briefly considered flinging myself off the side and rolling all the way down on my belly. If I wasn’t so averse to having sand in my clothes, or if I knew I’d have quick access to a shower and changing room, I probably would have done it. Instead I opted for another full speed run, turning around just in time to see a dozen other people running along side me. In conclusion, sand is fun. That is my big, insightful take away on this one. I went to a place with a lot of sand and I ran around and it was fun. I got to be a little kid for awhile, and I got to watch a bunch of other tourists do the same. I can see why the Dune Climb comes so highly recommended. It turns you into a child. Few and far between are the places you can arrive at by car and end up going back in time. 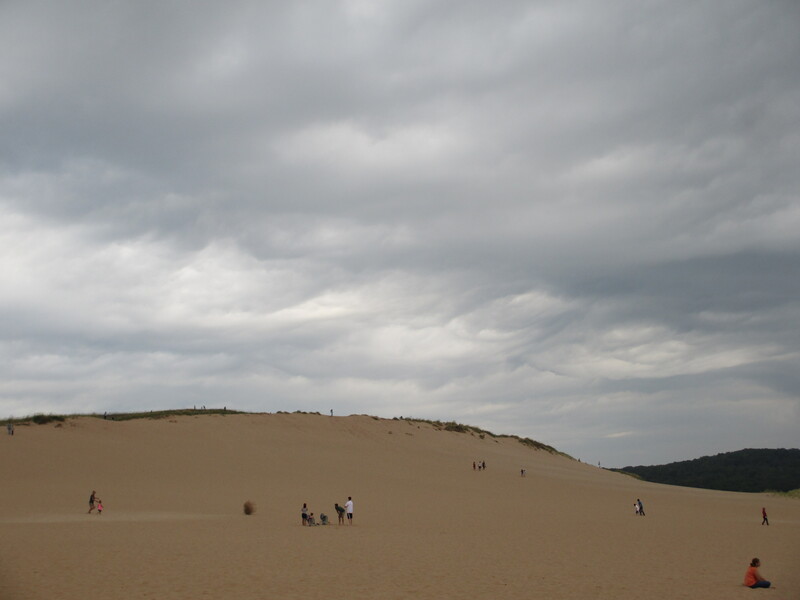 This entry was posted in Attractions, Nature and tagged childhood, Dune Climb, Lake Michigan, sand dunes, Sleeping Bear Dunes. Bookmark the permalink.